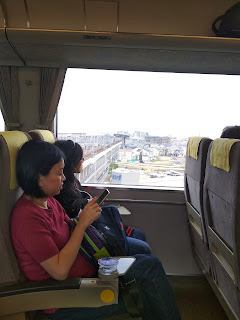 In the morning, after a light breakfast of onigiri (rice balls) from Lawson, we took the last shuttle (10am) from Star Gate Hotel back to the airport to catch the train to Kyoto. (Note: You should book the shuttle bus the night before). Travelling to Kyoto from Kansai Airport is very straightforward. The best deal we found was the Haruka + ICOCA. Simple explanation: the "Haruka" is the direct fast train to Kyoto on the JR line. The ICOCA card is like our EZ-link card - it's a stored value card that you can use on all JR lines and subway. (It doesn't give you discounted travel compared to buying tickets individually though, it's just more convenient.) The Haruka + ICOCA deal is a special package for tourists - Y3,600 (about S$45) each person which includes a discounted one-way ticket to Kyoto and an ICOCA card with Y1,500 value + Y500 deposit. You can book the package online and just use your confirmation email to pick up your tickets at the Kansai JR rail station. Tip: Where it says to choose the design of your ICOCA cards, pick "other options" and get the Kansai One pass (the one with Astro Boy). The value is the same but it's only for foreigners and gives you discounts at many tourist attractions. The Haruka train operates every half an hour. You enter via Gate B and go to Platform 4 or 5. If you chose unreserved tickets like us, you can only board carriages 4,5 or 6. It's a smooth, 75-minute ride to Kyoto, with stops at Tennoji and Shin-Osaka in between. There's also free wifi on the train but we didn't need it because of our Changi wifi. Kyoto Station is like the gateway to Kyoto. It is MASSIVE. The reason we had a light breakfast was because we had lunch all planned out. 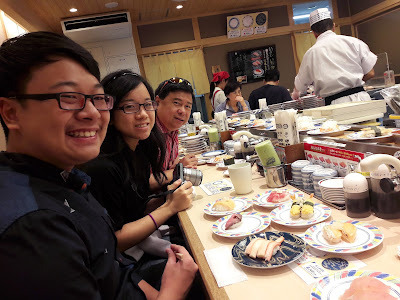 We were going to eat at Sushi no Musashi, a conveyor belt sushi restaurant. Confession: This is primarily a food trip. I looked up on Trip Advisor all the recommended eating places wherever we were going. Sometimes, it seems like I planned our meals around the sights more than the other way around. That's right, we are oinkers. Musashi is located near the Hachijo East exit, at the back of Kyoto station, street level. If you come out of this exit from the station, you should find it relatively easily but due to a small hiccup with our tickets, we came out of the Central exit and got completely lost in this maze called Kyoto station. After getting directions from the information counter, we finally made it but because it was then right smack during lunch time, we had to wait about half an hour for a table. 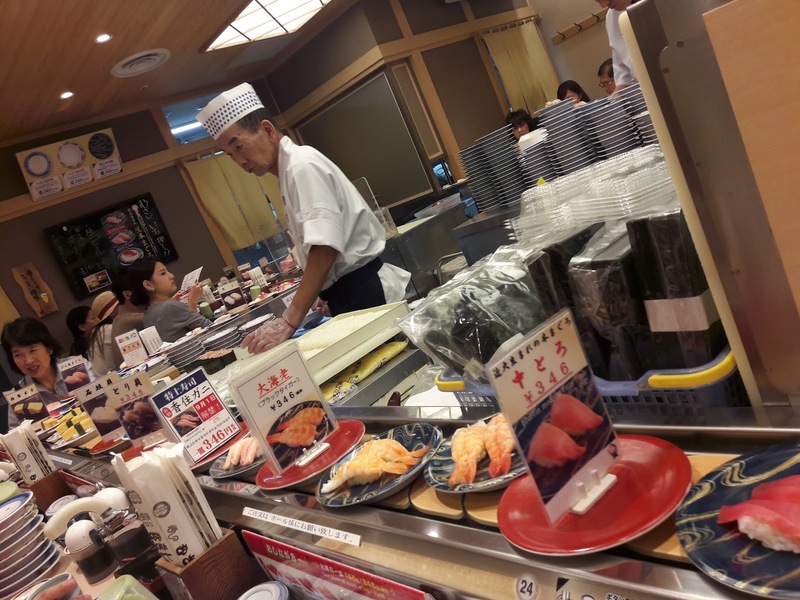 It's a small restaurant with just a row of seats around a conveyor belt. We had our two luggage bags with us and simply left them against the wall behind our seats (we were not the only patrons with luggage). There are only two prices: Y146 for regular plates and Y346 for premium (fully coloured) plates. The sushi was super fresh and delicious. The moment we sat down, we started grabbing plates off the belt - sea bream, tuna, scallops, crab, prawns, pike, shellfish, etc etc. The scallops were sublime - so juicy and sweet. Before we knew it, we had wolfed down 42 plates in under 20 minutes. Such pigs we are. After lunch, we headed for our hotel. 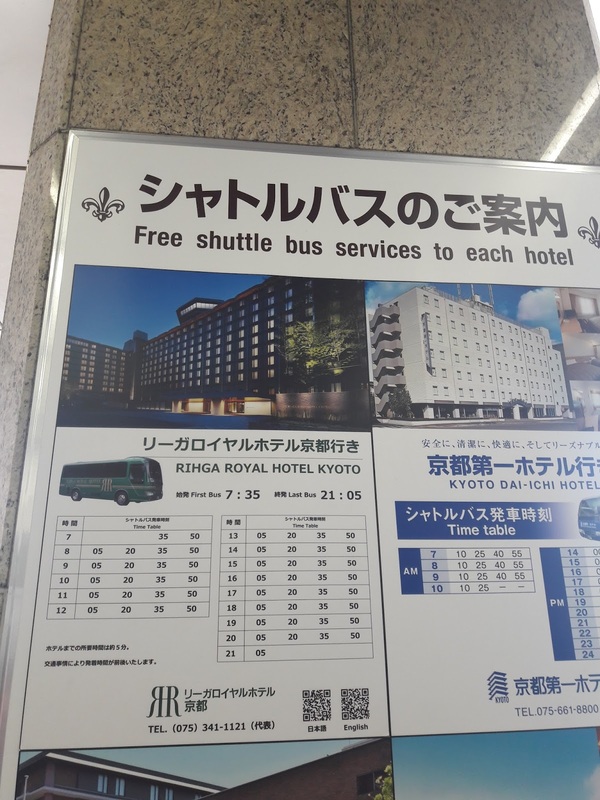 When researching hotels, I explored those close to Kyoto station. This was for ease of transport. The one I settled on was RIHGA Royal Hotel. In general, I find that for a family of 4, you get a better class of hotel for a similar price if you can find a family room, rather than 2 twin rooms. RIHGA Royal Hotel offered an attractive rate for a family room ($298 a night before taxes) although you should probably know that I booked this way ahead of time, in February, so I enjoyed an early bird rate. RIHGA is a 7-minute walk from Kyoto station but it offers a free shuttle bus to the hotel from Kyoto station and vice versa, every 15 minutes. The bus stop is at the Hachijo exit, near McDonald's. Again, like with Star Gate Hotel, the bus ran like clockwork. Once, the bus arrived slightly late and the poor bus driver frantically loaded luggage at top speed, like a panicky elf, still smiling and nodding to passengers all the while. We felt stressed for him as he finally pulled away from the bus stop...1 minute late. The RIHGA family room is a dream. Just look at it! Four beds with a living area in the centre. In a country where tiny hotel rooms are the norm, it's unreal to have the luxury of space, without breaking the bank, especially in such a convenient location. The kids were delighted. The bathroom has TWO shower stalls and two sinks, and the toilet is in another separate room. After a short rest, we made our way down to Gion, the traditional geisha district of Kyoto. So I had mapped out this great walking trail from Gion to Pontocho, with our two dinners (yes, two!) planned to flow seamlessly in this fantastic plan. But as usual, things seldom go according to plan and I managed to lead us in the wrong direction from the start. Anyway, you don't need to know all how we fumbled our way through Gion - here's my original plan and if you like, you can try and do it right! Take a train to Gion-Shijo station. Walk along Shijo Dori, You'll pass Kasagen, the oldest umbrella in Kyoto (from 1861). Walk to Hanamikoji Dori, where you will see in the corner, Ichiriki-tei - a famous teahouse in Japan where geisha and maiko (apprentice geisha) entertain clients. Walk to Gion Corner, a sort of visitor centre where tourists can watch performances by local maiko as well as demonstrations of other traditional arts such as tea ceremony, bungaku puppet theatre and ikebana flower arranging. You can see exhibits of artefacts in Gion Corner. Proceed to Yanagi Ochaya, built on the former site of the Willow Palace which was home of Emperor Sutoku's (1119-64) favourite concubine, Awa no Naishi. Walk along Yamato Oji-dori which has a row of shops selling traditional Japanese shoes and jewelry. Walk past Minami-za,the most prestigious kabuki theatre in Kyōto. Cross the canal to Pontocho, whichis the second largest hanamachi (geisha district) in Kyōto. It's very pretty - you can see people picnicking and cycling along the river banks. Each hanamachi has its own crest and Pontochō's is the plover, a bird which used to live in the waters nearby. The crest can be seen on red paper lanterns hanging outside ochaya and provides one way of spotting the teahouses among the other traditional buildings. In the narrow streets, it's not uncommon to see geisha in evening going to engagements. We didn't see any, though we saw many people dressed up like geishas. Remember I mentioned 2 dinners? Well, in the course of my research, I came across 2 restaurants that received a lot of good reviews. One was a specialty tofu restaurant, since Kyoto is known for tofu, and another was a 170-year-old restaurant specialising in Kyoto-style sushi. We couldn't decide which to go to, so we decided to go to both. Oink. The tofu restaurant is Togaden in Pontocho. We weren't too hungry after such a big lunch, so we only ordered a few snacks. The yuba sashimi was lovely. It's like eating a very smooth and thick layer of tau huay. The soya bean milk is very thick and rich. I wasn't crazy about the croquette as it had a beany taste, like a chickpea patty, but Kenneth and Lesley-Anne liked it. The doughnuts tasted like...doughnuts. I would say that unless you're a huge tofu lover, you can probably give this place a miss. Our second dinner venue was Izuju at the end of Shijo Dori in Gion (opposite the Yasaka Shrine). Many food bloggers have blogged about this restaurant. It's almost a historic landmark itself, specialising in Kyoto-style sushi, which is very different from the type of sushi we know. In the olden days when people were poorer, more rice was used compared to fish and the shape of the sushi was square instead of rounded, so more could fit into square boxes. The fish is also mostly cured instead of fresh. It's a small restaurant with only a few tables. Very traditional decor and quaint interior. What you need to know is that if you're going to eat in the restaurant, they expect you to order at least one dish per person. This meant that we ordered more than we intended to, even though we weren't that hungry. The presentation was lovely. They put all your orders in one large platter. We had the famous inari-zushi (beancurd skin), saba sushi, aji sushi and maki. This is saba (mackerel) sushi. It's wrapped in a sliver of seaweed that you have to remove before eating. After that, we took the subway back to Kyoto station. Here's an ethereal shot Lesley-Anne took of Andre in an underground train corridor. So Matrix-like. Dessert before returning to the hotel - matcha ice cream from a specialty matcha shop near the shuttle bus stop. Because our food adventures never end.